The recent copper theft epidemic has opened the eyes of criminals to a brand new avenue of making money. This knowledge will simply not disappear after the economy recovers. In times past, air conditioner theft did occur, but was typically focused on re-selling the unit to a contactor who then installed it into another home at a dirt cheap price. Now, the untraceable copper in the A/C units can be taken to virtually any scrap yard and turned into quick cash. That spells trouble for anyone who has a costly investment just sitting outside their residence or business without an air conditioner cage. To make things worse, the problem has not stopped at copper, it has involved numerous other metals such as brass and aluminum. Air Conditioner Cages are the best way to send a thief down the road. An A/C cage is a physical deterrent that can actually prevent a theft whereas other options cannot. Don’t take the chance of leaving these items exposed because the damage is to costly. Property Armor has been in business since 2003 and deals with these situations on a daily basis. 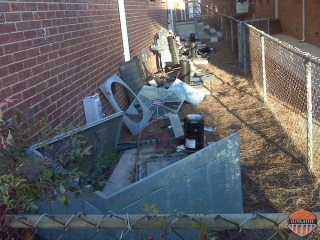 To learn more about the ongoing copper theft problem, the available solutions, as well as browse through a gallery of air conditioner cages, visit the Property Armor website at www.propertyarmor.net.